A few days past, I took a trip to Boston to go thrifting and came home with some wonderful things. The shirt, skirt and umbrella were all thrifted on the same day! Quite a wonderful feeling really. I also found an extremely unique purse which I will showcase in the near future. The umbrella is probably from the 1950's, everything is in working order, has the original silk sleeve, it also still repels rain. I was weary of testing it for some reason, I suppose I didn't want to ruin it, but, I got stuck in a down-pour on the way home that day. 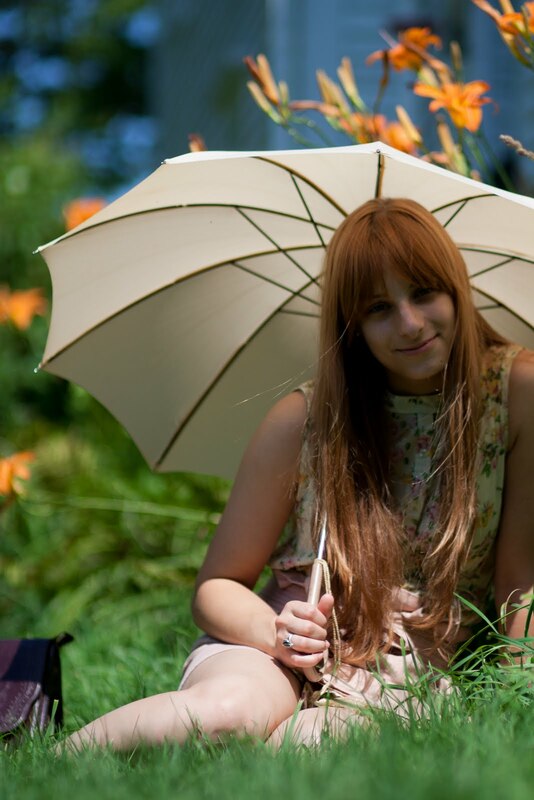 Today I used it as a parasol, and it worked wonderfully! It made such a nice light-box I may bring it with me when I go out to take pictures on sunny days. The shirt is also quite interesting, it's actually a very long shirt, almost a dress, but not quite. It's very versatile and I can't wait to wear it again in a different way. I love that you found a vintage umbrella! That's something I don't come across too often while thrifting!